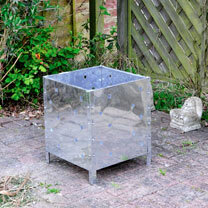 This square incinerator is ideal for burning your wooden pruning and turning waste to ash! Made from galvanised steel, it has a sturdy construction and holes cut along all four sides of the product allow for an increase in airflow to speed up the burning process. Self assembly. 46cm wide x 55cm high.